Lantern Rings are normally used by pumps that use some type of liquid to operate. The Lantern Ring goes around a rotating shaft, with the opening on the side of the Lantern Ring designed to allow lubrication of oil, grease, or even water to be shot through to the bearing surface. This unique design allows for easy maintenance to the pumps without disassembly of the entire pump. 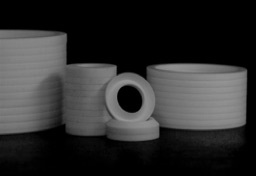 PTFE Lantern Rings are normally used because of their great chemical resistance and its ability to operate under harsh conditions. By having this great durability, this allows for the product to remain operable for a long period of time, thus decreasing downtime for repairs and maintenance of pumps if lubricated and used properly. 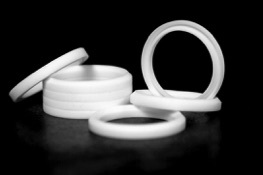 The main function of a set of PTFE V-Rings also known as Chevron packing, is to seal the stem of a valve to keep liquid or gas products from leaking into the environment. 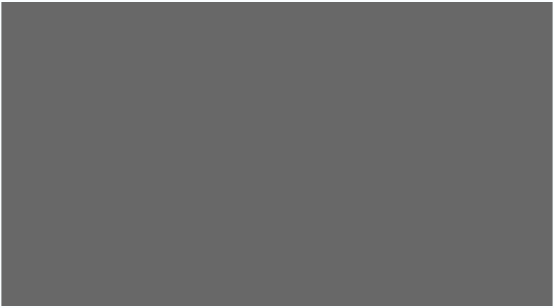 V-Rings are normally used on ball valves but are used in numerous other valves such as control valves, plug valves, gate valves, and globe valves. After a valve has been in service for a duration of time it will begin to experience wear on the internal moving parts. So periodic rebuilding requires the replacement of what is known as the “soft goods” in the valve. 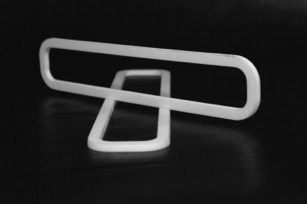 4B Plastics makes V-Rings from 3/8″ OD to 8″ OD and can machine custom V-Ring sets to your desired dimensions. Due to our years of industrial knowledge with making V-Rings for valves, we have determined that the more rings in the stuffing box of a valve equates to a tighter seal. The end result is smaller stack heights and less of a chance of a leaking valve. Are you a Chemical Industry or a facility that uses reciprocating compressors in the production of your products? Do you do normal maintenance to your compressor? Is your facility looking for compressor rings that will allow the compressor to operate longer and shorten any unplanned maintenance shutdown? Don’t wait for manufacturer's 2- week delivery time on a set of compressor rings! Experience the difference of 4B Plastics Express Compressor Ring Service that can get you a new set of compressor rings in days not weeks. 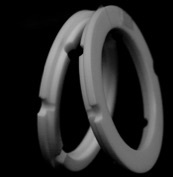 Expertly crafted compressor rings made by 4B Plastics are normally made of Carbon filled PTFE due to its high mechanical strengh and the materials ability to operate under harsh conditions. 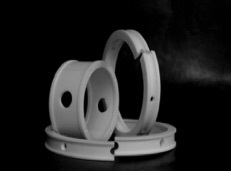 4B Plastics can make a new set to your specifications from 2″ to 60″.